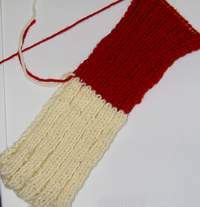 Last night I went to Michael's and bought some red yarn that would go with the off-white color I was using. It took me forever, but I knitted the red stripe on. I think it looks pretty good so far, its just taking...a long time. 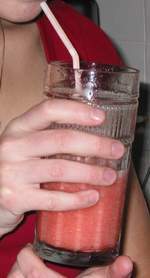 Me and my cousins made strawberry daquiri's (virgin) a few times during vacation, which tasted really good. 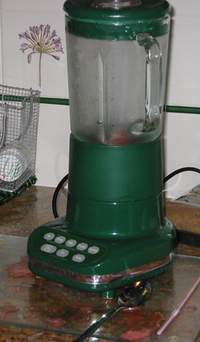 We blended together a can of frozen daquiri mix, can of water, and lots of ice. Yum. 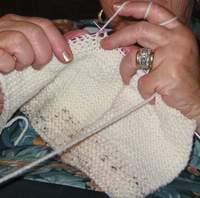 I'm on vacation now and since sometimes it gets kinda boring hanging around the family doing nothing, my grandma has taught me how to knit. 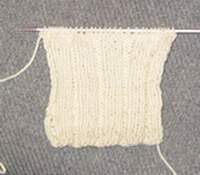 I told her I wanted to make a scarf, so she cast on 59 stitches to begin with. I told her that was kind of wide, but she didn't think so, so thats my scarf. Its taken me FOREVER to do this scarf, not to mention that I'm really slow at knitting. The scarf is all knit stitched, which is kinda weird looking, but makes it easier. I'll post pics of my progress soon when I get back to my normal computer. Also, on a sidenote, my cousin plays guitar, and I really want to learn how. 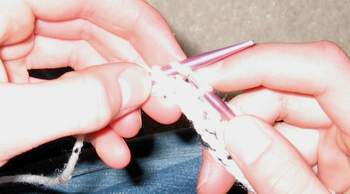 I found these two links (hobby craft and thread) that had directions on how to make weaved ribbon belts. I think it would be really cool to make another type of belt. That reminds me that I haven't put up the directions yet for my ribbon belts..whoops...hehe. It's already Thursday and I haven't gotten any gifts yet for anybody. Initialy I had been planning on making people things, instead of buying them...but somehow that just didn't happen. I've been so overloaded with school work, sports and a course I was taking to become a Medical Response Technician. Well, that course is done with but unfortunualy the school work isn't. I was going to make marble magnets, lipbalm, maybe bath salt (although I don't really know anyone who takes baths) and some other stuff. If I get a chance to today, I might go to some places and get something I need to make one thing, which I can't say because the person might look at this. Also, I got the new ReadyMade magazine which has some good ideas for making gifts. Tana's habitat has directions to make a cool felt hat out of an old sweater. If I get a chance I might try and make one soon, if I actually finish all the other stuff I should be doing instead. My little sister had a concert that she had to sing in today, and as part of her atire, she had to wear a poodle skirt. The choir directors gave them red skirts, but they had to sew on the felt poodle cut-out. Of course, my sister was incapable of performing such an act, so it fell to me to sew it on. It was quite easy to do a quick job on my sewing machine, and it turned out ok. Although when my sister came into the room to check on my work, the first and only thing she said is, "Uhh....the poodles a little LOW!" Yeah, I'd like to see her do a better job. Grr..
After the summer ended I'd forgotten to pull my carrots from my garden. The snow had finally melted today, so I went out to check on the damage done. Well..I wasn't very surprised to see that had little mutant carrots that were really odd looking and small. (the carrots alone just about summarizes up my gardening abilities) Anyways, I don't think I'll be planting carrots again next summer. I've added an archives page with my posts from august and september. You Grow Girl has some interesting gift ideas to make related to and using plants. I made some magnet marbles again this weekend. I don't really have any good magazines to cut pictures out of so I'll probably start printing some out. I found a cool new teen site that I really liked: teentwist.com. It's got a bunch of cool crafty stuff too! SNOW! AHHH! Its so nice to see 6 inches of snow piling up outside my house. It certaintly was great when we got an early dismissal at school too! 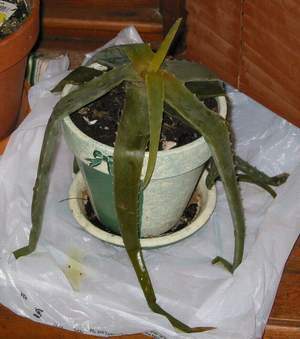 Unfortunualy, the snow kind of killed my aloe plant which I had accidently left outside and forgot about. 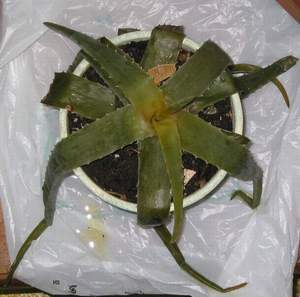 I'm hoping it will revive soon. It looks kinda like a dead octupus with all its little arms flopped down. So sad! 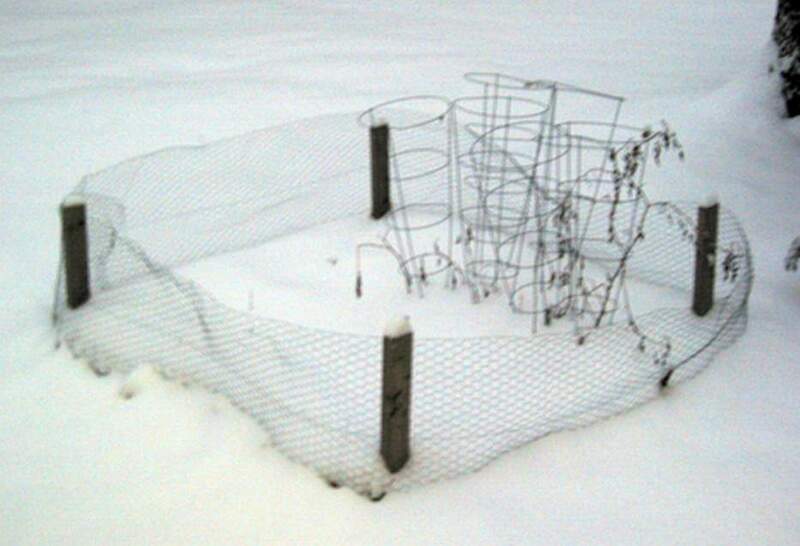 My garden still stands, but with a little snow still on it. At the end of the summer I kind of neglected it, and I never pulled out the carrots and I left some of the tomato cages in place too. Whoops! I've added a few new projects: ribbon belts and ribbon bracelets. I've put up some pics and explanation of a really odd experimental shirt I made during the summer. I've been so busy lately I haven't had time to do much of anything besides work. 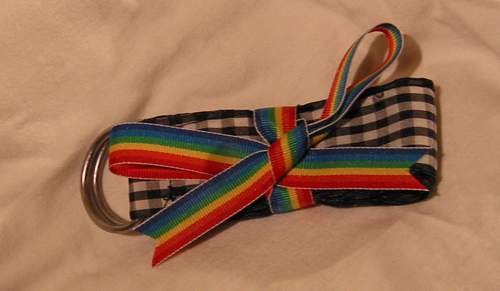 However, I managed to put aside studying to make my friend a ribbon belt for her birthday. I'll have the full directions up soon, but for now, I just have a semi-clear picture. I've been away for a few days visiting some cool people. As soon as I have the chance I'll start updating more regularly. 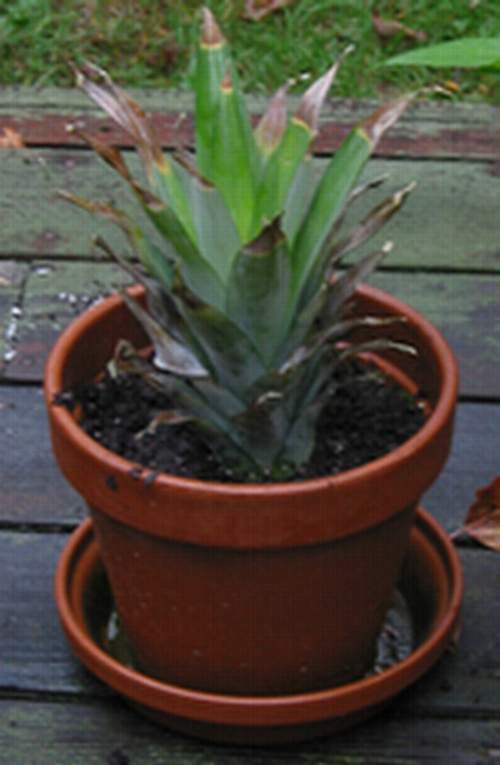 My pineapple plant started to die while sitting in the water, so I've moved it into a pot with dirt. Hopefully that will help it.